I wish I could travel more. Traveling is something I’ve barely done, and yet, it’s one of my favorite things. There’s so many things I love about it – mostly, I just love to experience something so totally different from what I’m used to. A different skyline, a different perspective and culture, a different lifestyle… and different food. I was in 8th grade when I went to Paris with my French class – such an amazing trip. While I didn’t photograph any of our meals, I remember them vividly. Crêpes, bought right on the street and spread with nutella; fresh sandwiches made with beautiful, crackly baguettes; and a fresh, flaky croissant served with orange juice and chocolat chaud every morning for breakfast. And Fauchon, the famous luxury bakery! My French teacher told a story of a boy one year who was left behind in Fauchon, so mesmerized by the pastries that he did not notice the group leave the patisserie and board the subway. Madame called it a nightmare. Me, I think it sounds like a dream come true! I really wish I would have discovered my love for baking at that point in my life. At the time, I’d never heard of Fauchon, and while I left feeling full and impressed (I bought an excellent fig éclair at what I thought a ridiculous price), I didn’t fully appreciate the visit. When I saw that April’s Sugar High Friday, hosted by Heather of Diary of a Fanatic Foodie, was to make a dessert inspired by travel (“Take Me Away”), memories of Paris came back to me with surprising strength. There were so many unbelievable desserts I tried. But what made me think utterly of Paris? And what was simple enough to make at home, right after school? The pastry that I always try first in a new French bakery is always the pear and almond tart. To me it seems like such a classic, something so simple but incredible when done right. 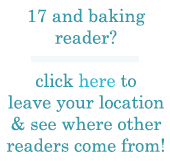 Maybe it’s a little unfair, but I tend to judge bakeries right away based on that tart. Unfortunately, my mom doesn’t care much for pear and almond tarts. The problem is mostly the custard, which is too rich for her. I didn’t want to make anything that she wouldn’t enjoy. I also decided on making just enough for two mini tarts, the perfect dessert for two. 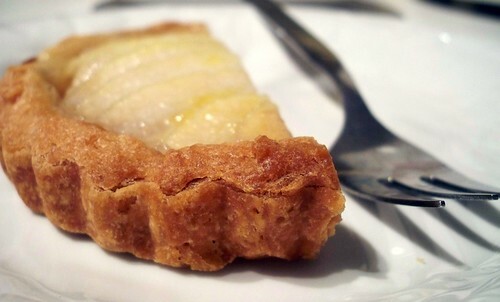 The solution was this simple pear tart, which is nothing but a flaky, buttery crust and sweet, soft pear. It’s a snap to make, and of all the tarts I’ve ever made – this was probably my favorite. My mother surprised me by saying it was among the top 3 best things I’d ever baked, in her opinion. Quel succès! You could double the crust and quadruple the pears and make a full sized tart, baking times adjusted accordingly. Preheat the oven to 375 degrees. Peel the pear and slice it in half lengthwise, from top to bottom. Core each half with a melon baller or a teaspoon, then coat with lemon juice to prevent browning. Slice each half lengthwise into 1/4″ slices. Toss in a bowl with sugar and cornstarch. Spread a thin layer of apricot jam onto the bottom of each tart shell. 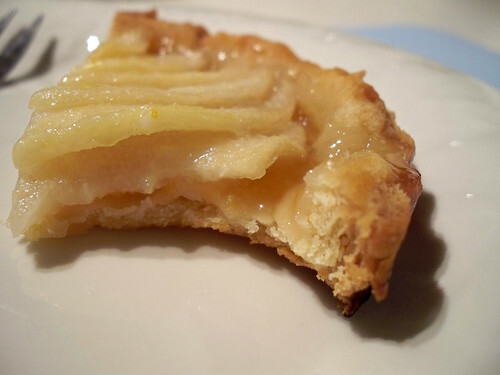 Lay the pear slices decoratively on top – I overlapped the pears, using the longest slices in the center of the tart. Pour the juices left in the bowl over the pears, then dot with butter. Bake the tarts for 45 minutes, then cover loosely with foil and bake an additional 5 minutes. Mix a tablespoon of apricot jam with a teaspoon of water, brush it over the pears as a glaze while still warm. Cool tarts completely before removing from their pans. In a food processor, pulse the flour, sugar, and salt. Add the cubed butter and pulse until the butter is cut in, with little “butter balls” the size of peas and of oats. Add the yolk bit by bit, pulsing after each time, then once all the yolk is added pulse the dough in long, 10 second intervals. When the dough clumps up, knead it gently a few times on a work surface just until it comes together. Chill the dough 1 hour before rolling. Butter two 4″ fluted tart pans with removable bottoms. Divide the tart dough in two and roll each half between two sheets of plastic wrap. Peel off one of the sheets and invert the dough on top of a tart pan. Pat the dough onto the bottom of the pan and ease it into the corners and sides. Gently and carefully remove the second piece of plastic wrap, then use a knife to trim the overhang to 1/4 inch. Fold the excess dough over, into the pan, to create double-thick sides. Prick bottom with a fork, then freeze at least 30 minutes. Preheat the oven to 375 degrees. Butter the shiny side of two squares of aluminum foil. Press them into the chilled tart pans, then bake the crust for 10 minutes. Remove the foil and press down on any puffiness with a spoon. Bake for an additional 10 minutes. Entry filed under: Pies/Tarts, Sugar High Fridays. Tags: apricot, French, pears, Sugar High Fridays, tarts. Your posts always make me hungry! I really like the angles you take with your close-ups. It’s so awesome that you got to go to Paris with your French class. I’m slightly jealous. Ooh, and this pear delicacy looks amazing! Your photo is fabulous. I like Pear Tart too. I have a question with regards to the tart crust, w/c cooking time (for the crust) did you follow when making this tart, i’m quite confused on that part? I’m sorry the instructions were confusing! Without the pear filling, the tarts bake for a total of 20 minutes. First you make the dough and freeze it for 1 hour. Then you roll the dough out and put it into the pans and freeze for 30 minutes. The next step is to bake the cold tart pans for 10 minutes. Then you cover them with foil and bake an additional 10 minutes. 2 hours freezing, 30 minutes freezing, 10 minutes baked, another 10 minutes covered with foil. The next step is to add the apricot jam and the sliced pears (the tart shell can still be warm.) 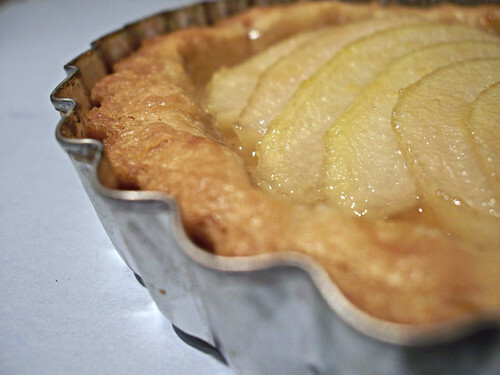 The already-baked tart shells, filled with pear, go back into the oven for 45 minutes. They are covered by foil and baked 5 minutes more for a total of 50 minutes with the pear filling. I hope I’m brave enough to attempt them myself one of these days. And as always, I love your beginning anecdotes – they really make the whole post much more exciting to read! Thanks Elissa. Gotcha! Thanks for the detailed instruction on the dough! I’ll be making this scrumptious recipe soon. Paris is one of the highlights of my travels as well. seeing these pictures just brought back the best memories. I can’t wait to go back. Sends me back home right away! You did any fine patisserie justice with this! This tart looks delicious! I am traveling to Paris for the first time in a few months, and I’m so excited about the food! My thinking is exactly the same as yours. Paris is my favorite place in the world and that will never change. Like you, I did not get to photograph much of it. It will always be ingrained in my mind though. Great Tarte, I wish I had some too. thank you so much for posting this recipe. i also have an affinity with paris. I can hardly wait to spend 3 months there (which is what i’m doing next summer), this tart is the perfect antidote. it is absolutely delicious. i never knew pears could taste this beautiful.